In Stock - Buy Yours Now! Don't be left out in the field or office without the ability to print customer receipts quickly and easily. Our portable thermal receipt printer works with the USBSwiper Software interface for Paypal and our other merchant account options. This printer also works with many other POS and softwares applications that have a 2.25" print option in their setups. 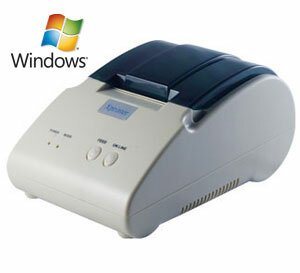 Order a USBSwiper Portable Thermal Receipt Printer NOW! Requires AC Power - Power Adapter IS Included. Make sure you print receipts for every customer in order to help protect yourself from costly chargeback issues. Get your USBSwiper Portable Thermal Printer NOW and starting printing receipts tomorrow!! Please read the specifications carefully to make sure the printer fits your needs. This printer does not operate cash register drawers. Need a different printer? We have 2 other models to fit your needs. Click on the links below to view them both! I have used the USBSwiper service for several months now, and am very impressed with the ease of it and also the immediate answers and service I have received at times when I have called with questions. Those who answer the phones are very helpful and never rush me, and are American, not outsourced. This is a very good credit card processing system.